The purpose of this book is to present a coherent method and procedure for designing systems, programs and components which are transparently simple and self-evidently correct. There is less than a 1% chance that the program is correct! As I noted in an earlier blog, even little discoveries makes one feel wonderful. Today I solved a small problem (i.e., made a little discovery) and I feel wonderful. I am reading a wonderful book, Introduction to Graph Theory. I am at the part where it describes complete graphs. A complete graph is one where each vertex is connected to every other vertex. 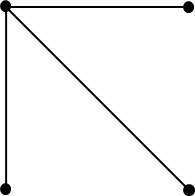 The author asks, How many edges are in a complete graph with N vertices? I took this as a challenge to use my reasoning skills to figure it out. The remaining vertices must form a complete graph amongst themselves. Ah Ha! Now we have a simpler problem: find the number of edges in a complete graph of n-1 vertices. One problem, however. 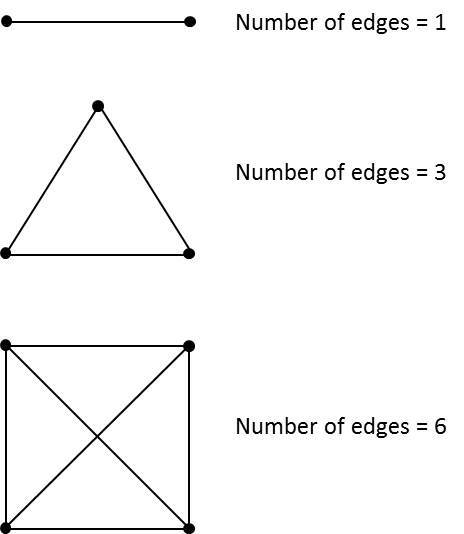 What are the number of edges when, say, N = 1000? I could implement the above program and set it to solve N=1000. But I know the mathematicians would tell me: Find a formula. I am pretty proud of myself. I solved it, not because it was a homework problem or a work problem. I solved it purely for the love of learning. I figured it out by simple reasoning. Lately I have been taking a cold bath each evening. As the weather gets cooler it is becoming more and more difficult to motivate myself to continue taking the cold baths, even though I feel fantastic after taking them. So today I decided to take a different tact: I would take a cold bath immediately after working out. I did a hard workout and by the time that I was done I was sweating pretty good; then I immediately jumped into a cold bath that I had previously prepared, and soaked in it for 15 minutes. Ah, I felt wonderful. Now this is really interesting: I took my body temperature immediately after working out (before jumping into the cold bath) and it was 94.1 degrees. Then I took my body temperature immediately after soaking in the cold bath for 15 minutes and it was 97.1 degrees. Isn’t that fascinating? Apparently, when one works up a sweat, the body responds by cooling down the inside; and when one cools the outer body, the body responds by heating up the inside. tension and enjoy the triumph of discovery. Today (Sunday morning) I went for a 90 minute walk through a nice nature trail with a friend. During the walk we discussed varied topics, such as the three theories of aging and the moving blueberry harvest season. It was a wonderful walk and a delicious discussion. Contrast with sitting in a room, staring at each other across a table. That is a very uncomfortable environment. It puts pressure on everyone to try to be profound and sound intelligent. I propose that all meetings be turned into walking meetings. The entire group should go outside and walk and talk. I suspect that meetings would be more productive that way. I suggest that researchers could better explore deep problems if they spent more time discussing while walking. I want to find someone interested in deep discussions on various topics in Computer Science, such as computability, complexity theory, parsing, XML. Actually, anything math- and science-related would be great. If you enjoy walking, deep thoughts, and live in the Boston to southern New Hampshire area please drop me a note. “Now, the true charm of pedestrianism does not lie in the walking, or in the scenery, but in the talking. The walking is good to time the movement of the tongue by, and to keep the blood and the brain stirred up and active; the scenery and the woodsy smells are good to bear in upon a man an unconscious and unobtrusive charm and solace to eye and soul and sense; but the supreme pleasure comes from the talk. It is no matter whether one talks wisdom or nonsense, the case is the same, the bulk of the enjoyment lies in the wagging of the gladsome jaw and the flapping of the sympathetic ear. You are currently browsing the Diverse Thoughts blog archives for September, 2013.